Furious after discovering that Negan has killed Spencer, Rick orders a lockdown at Alexandra, while Andrea takes up a sniping position in the bell tower to cover their attack. Negan is left scrabbling in the dirt as Andrea takes out his guards, leaving Rick free to close in for the kill. But before Rick can take out the Saviors leader, Negan‘s snipers open fire, quickly turning the tide of the battle as Rick and his fellow survivors find themselves outgunned and at Negan’s mercy. 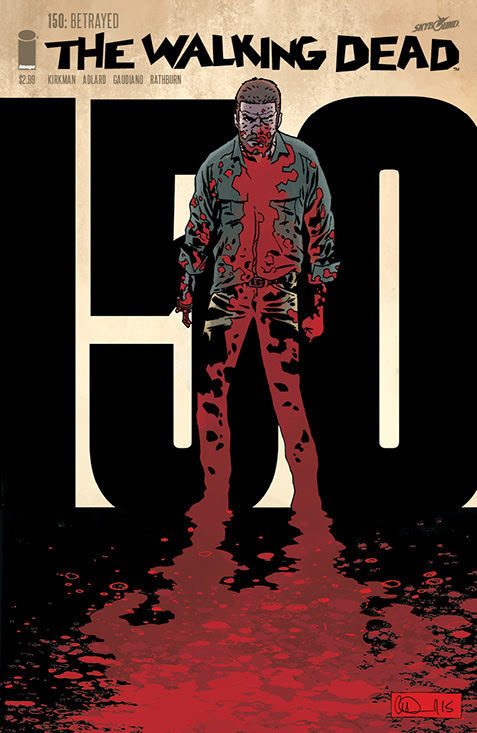 It would seem that Rick has made a critical mistake as The Walking Dead #113 opens after his plan to kill Negan backfires. Andrea watches from the bell tower as Rick and his people are surrounded outside the gates of Alexandria. Before Andrea can help, one of Negan’s men sneaks into the bell tower and attacks her. 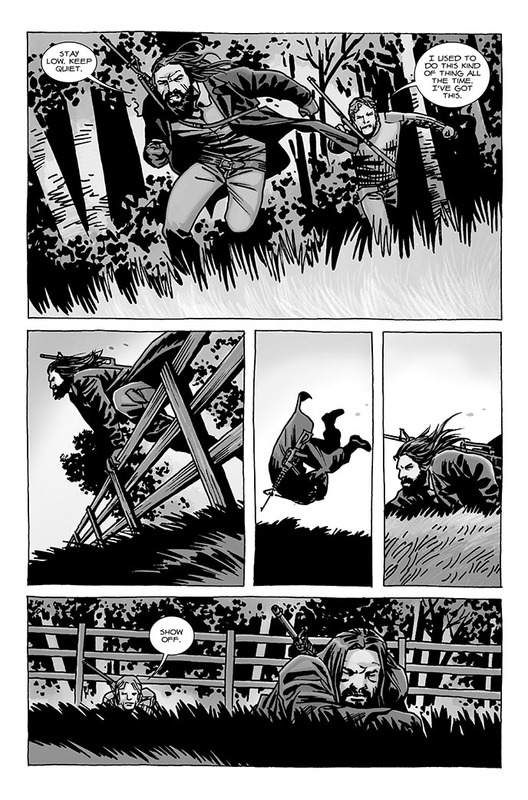 In an attempt to help his father, Carl shoots at Negan, but misses and takes a chunk out of Lucile instead. The Walking Dead #113 has Rick being beaten down yet again by Negan, as his attempt to kill the Saviors leader goes disastrously wrong. Now that Negan wants Carl to pay for what he’s done to Lucile, we see Rick at his most desperate as Negan resolves to break him by taking his revenge on his son. In fact Negan seems more incensed by Carl shooting Lucile than Rick’s attempt on his life. The sight of Negan cradling the weapon in his arms, ranting about the unforgivable act Carl has inflicted to his “lady”, is almost as perverse as it is pathetic. Robert Kirkman continues to make Negan one hell of a compelling character, sick, twisted, and lewdly psychotic, he has become a fearsome nemesis for Rick and the survivors. 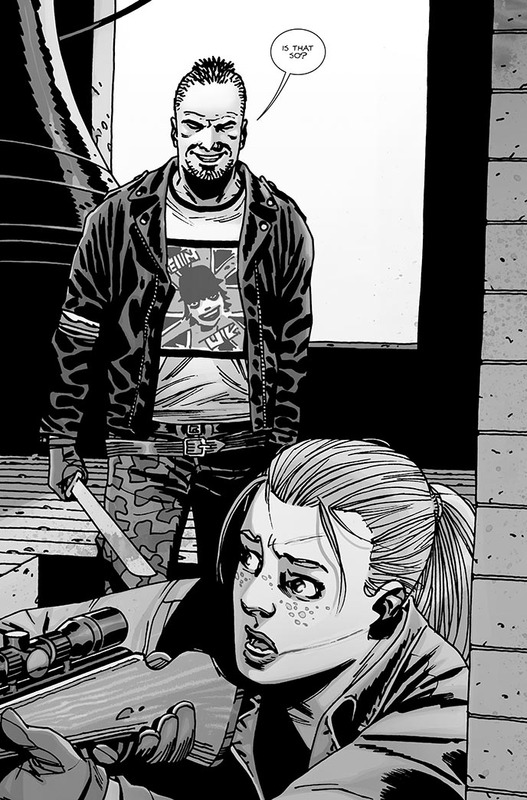 This issue also sheds some light on the barbed wired love of Negan’s life, Lucile. Although he may have an entire hareem of women broken to his will back at his camp, it is Lucile who Negan truly loves. This inanimate object has become something to be cherished, having saved his life many times over, and the leader of the Saviors is only too happy to share the intimate details of exactly how much pleasure she brings him. Jesus also makes an important discovery this issue, when he investigates the outpost that Dwight told Ezekiel about. Apparently it was still in use, however it is completely deserted. Now would certainly be a good time for Jesus to bring in some much needed reinforcements from Ezekiel and the other Hilltop communities to help Rick. The deserted outpost also raises some doubts about Dwight, he is still a relatively unknown quantity, and it’s entirely possible that he could have been lying about wanting to help them just so he could uncover the full extent of their plans. 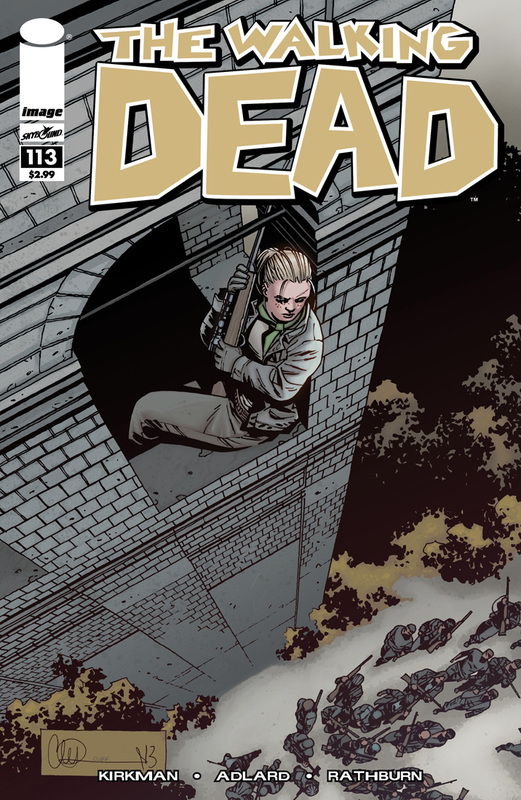 The Walking Dead #113 also features some great artwork by Charlie Adlard, with the tension building on the ground as Negan confronts Rick; it is Andrea’s brutal fight with one of Negan’s men in the bell tower that really makes this issue. Every moment of this savage attack is conveyed over a series of intensely structured pages by Adlard, Her spirit remains unbroken, despite the terrible beating she suffers, if anything it seems to strengthen her resolve, and she dishes out just as much punishment to her attacker n return. The final moments, with Andrea and her assailant struggling precariously on the edge of the window is absolutely nail biting stuff. Back on the ground Rick glances upwards and sees a body fall from the bell tower. 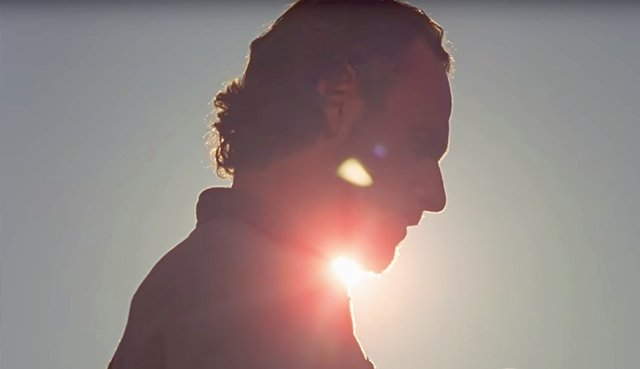 Believing that Andrea is dead Rick crumples to his knees, overwhelmed with grief and shock, seemingly resigned to his fate as Negan closes in to enact his revenge. “You and me, that’s the rule, we don’t die…” Andrea’s words from earlier resonate over this issues closing moments. This mindset has served them well in the past, keeping them both alive when all has seemed lost, and it must surely become one that the remaining survivors will have to adopt if they are to stand any chance against Negan and the Saviors. This is another great issue by Robert Kirkman and Charlie Adlard, with events clearly building towards the All Out War storyline, it looks as if our patience is about to be rewarded. It has been just over a year since Negan and the Saviours were introduced, ever since Negan killed Glenn in issue #100 the plot has dragged a little at times, but now things are set to really kick into overdrive. It has taken a long time to get to this point, lets just hope that All Out War can live up to all the hype, and that Kirkman has something really special in store for us.